30 Jan How to arrive to the Middle of the World? 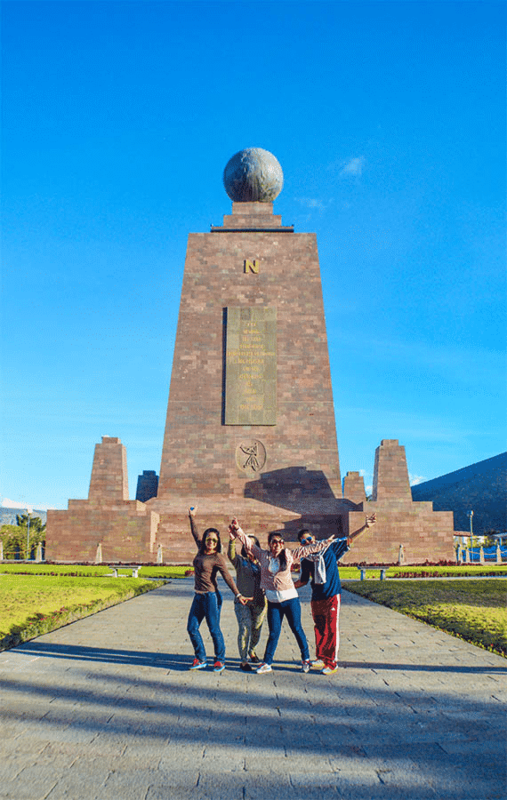 Hundreds of tourists visit every day the famous monument of the Middle of the World located at north of the city of Quito on Manuel Córdova Galarza Avenue Km. 13.5. People want to know the iconic monument which represents the Equatorial line from which the country takes its name. At the Middle of the World Touristic Complex you will be able to place one foot on each of the two hemispheres at the same time, and take an incredible photograph in this unique site where the Equinoctial Line passes. Middle of the World Touristic Complex is open 365 days a year. Do not forget that cultural events take place every Saturday and Sunday. In this note, we want to tell you how to arrive to the Middle of the World. You can arrive to the Middle of the World if you take a bus called “Middle of the World” that usually passes through Mariscal Sucre Avenue, also known as Occidental Avenue. Do not forget to take the bus in the South-North direction. These buses usually pass every 30 minutes, and they will drop you off in the outskirts of Middle of the World Touristic Complex. 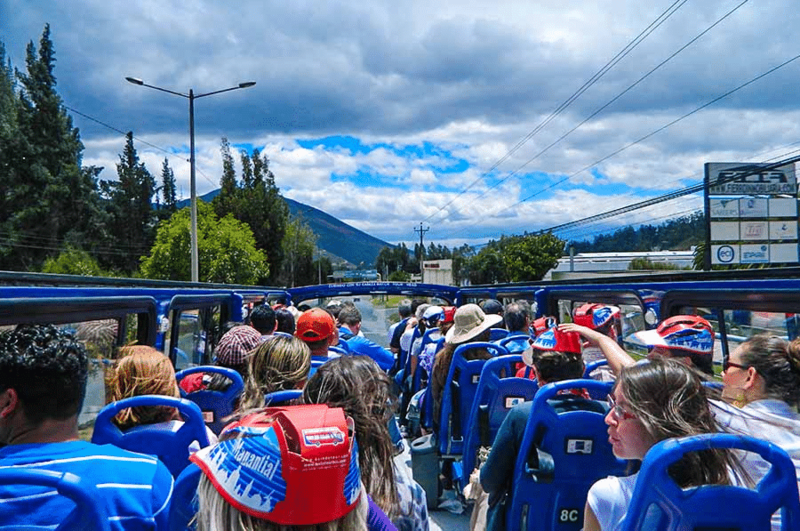 You can choose also the METROBUS System that goes to the north of the city of Quito. In the final station known as “La Ofelia” you have to take the integrated bus “La Mitad del Mundo” (The Middle of the World). This bus will also leave you in the outskirts of Middle of the World Touristic Complex. You will find the METROBUS stations throughout America and La Prensa Avenues. From any point of the city, you have to take Occidental Avenue, and later Manuel Córdova Galarza Avenue until kilometer 13.5. If you go by car another option is to take the extension of Simón Bolívar Avenue that goes from Carapungo until Middle of the World Touristic Complex. 11H05 – “El Quinde” Visitors Center in Venezuela Street and Espejo (Historic Center – Plaza Grande). Stop #10 Quito Tour Bus. 11H25 – La Mariscal – Plaza Foch. Reina Victoria Street between Calama and Mariscal Foch. Stop #3 Quito Tour Bus. 11H50 – Bulevar Naciones Unidas. Shyris Avenue and Naciones Unidas Avenue. 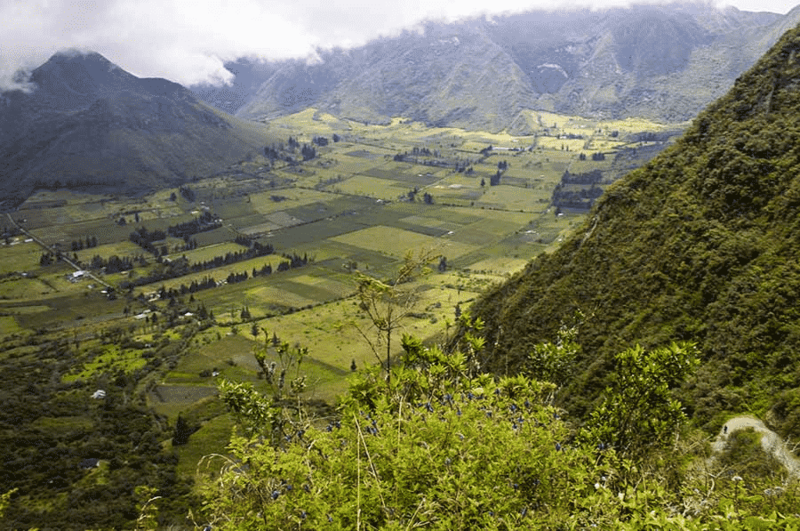 In this tour, you will not only know the Middle of the World Touristic Complex that houses the famous monument, but you will also start by visiting the Pululahua Volcano Crater Lookout, one of the only two inhabited craters in the world. Once in the Middle of the World Touristic Complex, you will visit the Equatorial Museum, Cultural Pavilions, Colonial Quito, Planetarium, and Train Station. 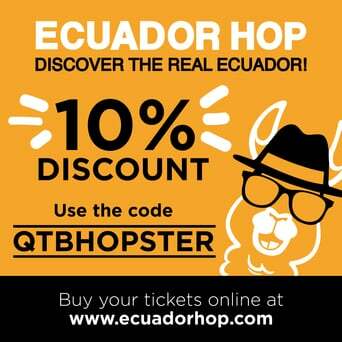 Then you will take a guided tour of the Ancestral Homes, Cacao Plaza, and the new Beer Museum. In addition, you will visit the Museum of the Equinoctial Line where you will see different demonstrations of natural phenomena, the force of gravity, and the balance that are manifested in the equinoctial zone. The best part is that you will have a Full-Pass Access V.I.P. to enter to the Ethnographic Museum and all its attractions, and you will get the best picture with one foot in each hemisphere. This tour includes: tourist transport, Bilingual Guide (English – Spanish), entrance to the Pululahua Volcano Crater Lookout, and entrance to Middle of the World Touristic Complex – Full Pass. We are sure you will love it!